Guido and I arrived early Friday morning and checked into the South Point Hotel. Staffan Berg came by at 10:30 a.m. and let us know that True Parents were arriving and we could be among the welcoming group. We proceeded to True Parents residence and were able to welcome their party at 1 p.m. Guido was moved by the opportunity and it was a good start to the weekend. Perry Cordill, formerly the Nevada State Director, also welcomed True Parents along with fifty or so local members. Afterwards, Staffan took Guido and I to the Peace Palace which is being constructed in the front third of the large warehouse True Parents purchased near the Las Vegas airport. The construction manager was on site and walked us through the floor plan. Then we visited the site of the, soon to open, Oriental School of Medicine which has received state approval to begin courses in the Fall. We also stopped by True Parents' former residence which served as the main venue for the reunion. 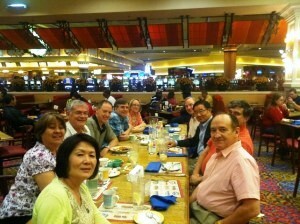 At 7 p.m., 12 alumni who had arrived gathered for a buffet dinner at the South Point. Bishop Ki Hoon Kim, from Chicago, just found out about the reunion that day and not only attended but bought dinner for all graduates. We introduced ourselves around the table and shared fellowship until 9:30 p.m.
Twenty-five of us gathered at True Parents former residence by 9:00 a.m. and began the day's program (see below). The main room was set up with chairs, microphone, speakers and screen. Guido led off with an interesting discussion of the Last Days with a lot of scientific insights. I won't spoil this since I believe we'll have a repeat performance this weekend. Dr. Chang Shik Yang was attending True Parents but gave notice that he'd like to offer greetings and a report at 10:45 which he did: a rich presentation with lots of inside details about True Parents in Las Vegas. Afterwards we took a group photo on the front lawn outside the residence. My understanding is that Dr. Yang showed the photo to True Parents. That took us to lunch which was prepared, buffet-style on the back veranda by the Japanese missionaries who were there. Dr. Yang stayed but was called back to True Parents. The rest of us enjoyed conversations on a variety of subjects, seminary-style. After lunch we had testimonies from alumni that are working in Las Vegas. Dan Stein relocated there with his wife to pursue full-time minister work until Foundation Day. He shared his approach and lessons learned. Sue Burkhardt maintains an active ministry to the Las Vegas Chinese community, witnessing daily, and she gave an inspiring testimony as to the fruitfulness of witnessing there. Craig Williams operates an independent church ministry dedicated to direct proclamation of True Parents, also shared his testimony. Finally Staffan Berg, who impressed us all with his faith and service, gave us a good view of things from a District Director's perspective. I, then, conducted a session dedicated to UTS and Barrytown College. I shared "A Short History of UTS" covering the core orientations of the our four administrations centering on our four presidents. Most of the alumni present only had a snippet viewpoint based on the 2-3 years during their study, and I was told by several that they appreciated seeing the larger picture. There was a seamless transition from the "Panzer" administration's emphasis on cultural engagement to the PowerPoint on Barrytown College which was presented in full, and generated interest among those present. The last organized session of the day focused on the UTS Alumni Association. Basically, we broke into small groups and listed what alumni appreciated about the association and what improvements might be made. Recorders reported each group's result (see below). There was a break before dinner and the alumni were very good in agreeing to fill out the UTS Alumni/ae Survey for our re-accreditation self-study. They took it seriously and doubtless provided good data. I hope the same can be done at the Barrytown reunion. It worked well because we set aside a time and did it all at once. We concluded the day with dinner after which all adjourned to their places of residence. We had a variety of optional events. First was the Lovin' Life service at the Rave Theatre, a large and very modern movie theatre in a mall complex. This venue has gotten play in the wider church and it was good to experience first-hand. They do an excellent, high tech job of building off the national service, especially with visual effects, often featuring congregation members. The service is also a focus of witnessing activity. Dr. Yang introduced UTS alumni to the congregation. Afterwards, he invited the alumni to "the best Korean barbecue" in the city and it didn't disappoint. The LA crew left after lunch. Others had the opportunity to visit the Peace Palace/warehouse and to take photos at True Parents residence. Nine alumni signed up for a boating cruise in one of True Father's helium-designed boats on Lake Mead. An added "Last Days" phenomenon was a lunar eclipse which was 95% visible in Las Vegas and 100% some 60 miles out in the desert. Guido and Dan Stein drove out carrying dark sun shields and were able to absorb the full effect. That was pretty much it. A few alumni were still around Monday. The Andersons headed to Sedona, 4 hrs. away. The Willis's headed to one of the other canyons. Several toured some of the casinos on the strip. All in all, it was an excellent experience and we hope foundational for the Barrytown reunion and future activities.